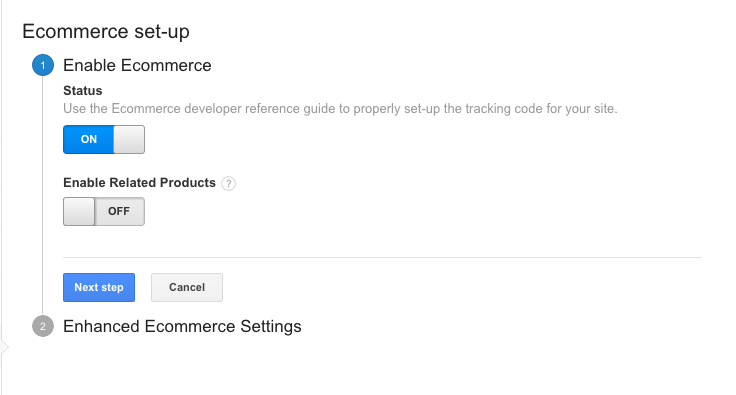 Enhanced Ecommerce Tracking for Google Analytics allows you to dynamically measure user interactions with products on your website shop throughout the user's shopping experience. It includes areas such as; product impressions, product clicks, viewing product details, adding a product to a shopping cart, initiating the checkout process, transactions, and refunds! This information will be extremely useful in assessing conversions and how to improve your users ordering experience resulting in higher sales. Select "Admin" at the top of your Analytics account. Select the "View" for which you want to enable the Enhanced Ecommerce tracking. In the View column, click "Ecommerce Settings"
Within the Step 1 setting, "Enable Ecommerce", set the status to "ON" and select "Next step". Remove the other, older category of Ecommerce reports as it is no longer visible. Please note you can turn this option off to restore the older category of Ecommerce reports if you so wish. 7. Add your optional funnel steps. You can come back and do this if you so wish. Once you have actioned this, you will see a green "success" at the top of your screen. Following this you will be able to start using the Enhanced Ecommerce Tracking in your Create account right away! Enhanced Ecommerce Tracking provides you with a number of insightful and actionable reports. For examples of the types of reports you are able to pull using this feature please see Google's "Enhanced Ecommerce Reports". To begin tracking you will need to have your Google Analytics Account connected to your Create site - please see our HelpCentre guide "How Do I Add Google Analytics To My Site" for more details. This advanced feature is available for members on Shop Builder Pro, and Shop Builder Advanced only. If you have any questions about changing your account package, or would like any help using the feature please do contact your Account Manager, we are always happy to help!